The Logic Model: A supermodel applying logic to ponder something important? No, we are talking matters less hedonistic, although crucially important in the evaluation process. A Logic Model is an important tool to help set up a robust and meaningful evaluation. The process of developing a Program Logic Model is an important first step carried out by the consultant (evaluator) and the client project team, in close collaboration with one another. It is important that anyone who has had any involvement in designing or implementing the program or initiative be present in a working meeting for this process. 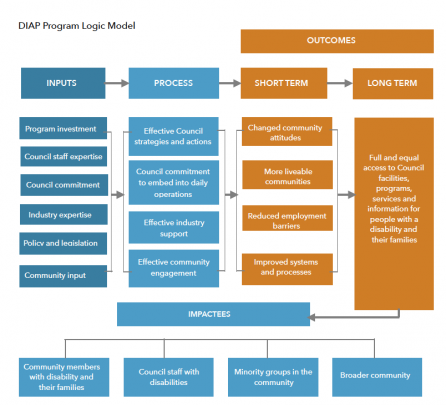 Program Logic Models are usually visual representations of how the program, policy, framework or initiative is intended to work, as opposed to how it is believed to be currently working. They should show the process of ‘if this’ (happens), ‘then this’ (results), throughout every stage of the program’s rollout. For this reason, it can also be referred to as a Program Theory. Ideally, a Logic Model will have been prepared by the project team in the program/initiative design process, but often this is something that is overlooked until the evaluation stage, so it often becomes the task of the evaluator. Why develop a Program Logic Model? – It provides a basis from which to identify relevant evaluation question and performance indicators. Step 1. Start at the end. What are the ultimate results that the program/strategy/ initiative is intended to generate? Who should be impacted? These are Impactees and Impacts. Step 2. Describe the steps or changes required to progress towards the intended impact. These are Outcomes. Step 3. Name all of the activities needed to generate the outcomes. Step 4. Define the resources/inputs that link directly to and supply the activities. These steps are best carried out in group discussion, using sticky notes, blank paper and thick felt tip pens, brainstorming all ideas, before making decisions about which ones must be kept, which could be kept, and those that are not relevant. The resulting Program Logic Model may be linear, or nonlinear. It may be represented in one of a range of visual ways. Importantly, its visual presentation should best illustrate the connections and causal pathways between each and every step in the program’s delivery. Recently, I have prepared two unique Program Logic models as part of the evaluation process, for two clients managing very different types of initiatives. It was important to visual represent these two programs in different ways, to reflect the contrasting complexity of their rollout. As part of an evaluation of Cumberland Council’s Disability Inclusion Action Plan (DIAP), a linear representation seemed appropriate, as the program was delivered in a systematic way. 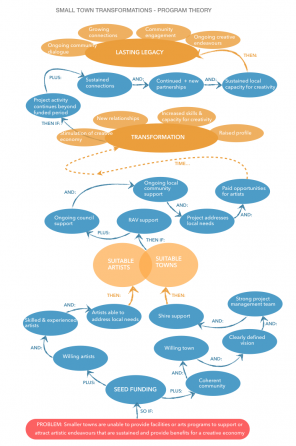 However, Regional Arts Victoria’s Small Town Transformations Initiative was much more complex and convoluted, with many more connections and interconnections. A nonlinear Program Logic Model was developed in this instance. These contrasting Logic Models are shown below. Program logic models are particularly important when carrying out a Process Evaluation, which documents the process of establishment and monitors how a program has been implemented, an Impact Evaluation, which explore causal pathways, and evaluations that explore theories of change. An all three of these situations, generating a program logic models is a crucial first step to ensure the intention of the program and its delivery are well understood. However, any evaluation should begin with the process of developing a Program Logic Model. And surely that’s going to provide more food for thought than a supermodel pondering something interesting…?